Anyone seeing Synette Tom walking her apricot Labradoodle around West Menlo Park might think the dog’s name is Gibi. At least that’s what the dog’s seriously souped-up collar says. In fact, the scruffy pup’s name is Kale (Hawaiian for “Charlie”), and Gibi is Synette’s GPS pet locating device that’s currently drawing the attention of the world’s largest retailer. We’re talking Walmart. “It’s exciting and kind of surreal,” admits Synette. Back in July, Walmart solicited “Get on the Shelf” contest entries from inventors and small business owners eager to make their products available to its millions of customers. Selected from a pool of thousands, Gibi is now one of 20 finalists in the Walmart contest. This week, the top four products in the Great Gadgets category face off in an online vote with the winner vying for the contest grand prize. At stake: pre-orders from Walmart.com and vital marketing support — the stuff of dreams for a fledgling start-up. As an electrical engineer, Synette designed electronics for communications satellites, which eventually led to system design and business development. Back in 2005, she was recruited to the Bay Area by Space Systems/Loral in Palo Alto. While her realtor encouraged her to “get a condo in downtown Palo Alto,” Synette checked out a listing in Menlo Park and immediately thought, “this feels like home.” When she left Space Systems/Loral in 2009, her Menlo Park home became her startup home base. As Synette points out, one in three pets go missing in their lifetime, and four million are euthanized every year because their owners can’t be identified. Menlo Park is no exception to the lost pet phenomenon, as witnessed by the steady stream of postings for help on Nextdoor.com. Gibi (pronounce like Andy Gibb-y) is at the alpha prototype stage, but thanks to Blue Startups, a Hawaii-based venture accelerator, along with additional investors and friends and family funding, Synette has raised enough money to target mass production by next April. As for the Walmart contest, it’s now up to America’s vote. If Gibi fans cast enough online ballots October 14-17, Synette’s pet-tracking technology will “get on the shelf.” Beyond that? “We have a great product to help people find their pets. We know there’s a market out there, and we plan to nail it,” said Synette. This looks exactly like the Tagg Pet Tracker (www.tagg.com) we have for our Corgi. Did you get the concept from them? How are you different? What a cool product. Sure hope it makes the Walmart cut. It has my vote. Great to see a local business woman do well. Too bad i’d have to join fb to vote for it. It’s definitely something I would use. Thanks David! Please sign up for Gibi’s mailing list at gibitechnologies.com to be one of the first to know about availability. Thanks for your interest in Gibi. Sorry to hear that your husky gets out occasionally, but statistically it is expected that 1 in 3 go missing in their lifetime. 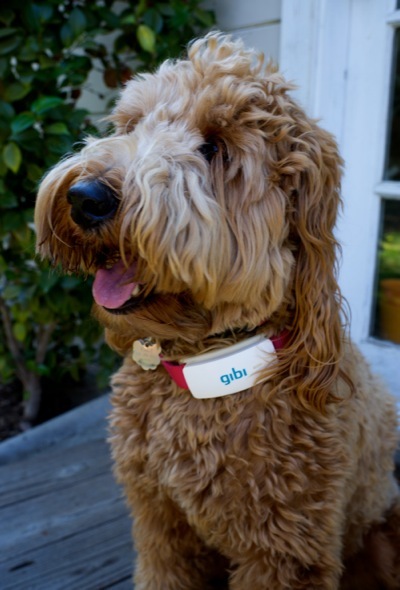 Gibi is designed to put the power of finding your pet in your hands with the push of a button and eliminate the wait and worry. On the Gibi app, you can create a Safe Zone, around your home or where you expect your dog to be such as a day care or park. We will monitor the Safe Zone and let you know if your pet has left the Safe Zone. These Safe Zones can be just about any polygon. If you pre-order a Gibi from Walmart.com, your purchase comes with 3 months of service. Following the 3 months of service included, it is your choice of either a monthly subscription at $9.99/month or yearly subscription of $99/year. Hope this answers your question. Let me know if you have more. Congrats and best of luck, we should all hooked up at ‘’Luttickens after 5’’ one Saturday night. Great tunes, just heard South of Manhattan there last week. Tim and the SSL gang. Hi Meaghan, we understand that people are particular about their pet collars. We designed Gibi to fit most third party collars found in the pet aisle, including ones with thin or thick width and quick release clips. Gibi will fit well on larger cats. Thanks! I am very excited about this. My dog was lost 2 days ago for over 12 hours…. This sure would have been great to have. When will this be available and will you be offering other color options. I’ll be sure to comment back as soon as I get it and can try it. I don;t see anything on the web site about a monthly service fee like the other pet gps systems (Tagg, Garmin, etc). I am looking for a Pet GPS for my husky that gets out occaisonally even with a fence and invisible fence. I am looking for this type of dog tracker. I need one that will transmit for at least 3-5 miles, work on the Apple or Google maps on either or both, iPad and iPhone 6, and works in real time as well as keeping a record of where he has been. I wonder if someone can get back to me on whether this invention is capable of these needs. I have a Dobberman that wanders over 18o0 acres and I am trying to find out where he goes. Also, it would be great if I could call him home while he is wandering.